By Meghan Trainor. Arranged by Erin Miesner. Score, Set of Parts. 16 pages. Published by Erin Miesner (H0.224611-262313). 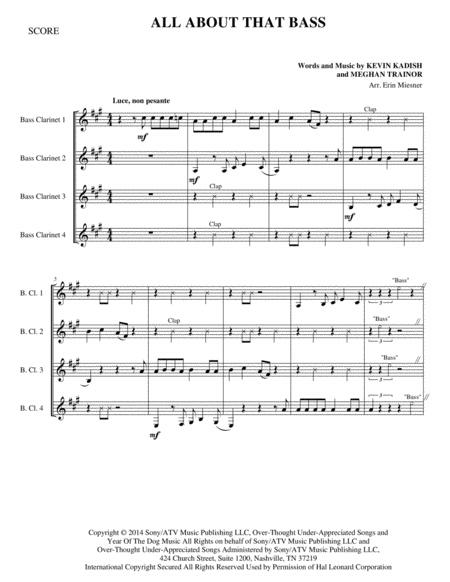 A fun take on the chart-topping hit, this piece is certainly All About That Bass (Clarinet). Suitable for ensembles of all ages, it's perfect for high-schoolers and beyond. 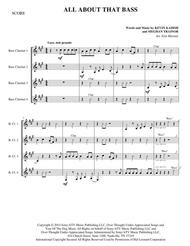 Parts include Bass Clarinet in B-Flat 1, Bass Clarinet in B-Flat 2, Bass Clarinet in B-Flat 3 and Bass Clarinet in B-Flat 4. Learn more at erinmiesner.com and "like" EM Publishing on Facebook.